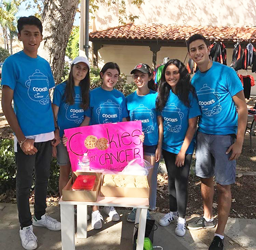 Cookies for Cancer Club - We'd like to thank the students at Beverly Hills High School for their continuous efforts and contributions to support Children's Cancer Research Fund over the last four years. Grounded Kidswear - We'd like to thank Kathleen Sino, Founder of Grounded Kidswear, for choosing Children's Cancer Research Fund to be the recipient of 20% of the net sales made by Grounded Kidswear in the month of May. For 4 years, Kathleen worked at a pediatric hospital and was a firsthand witness to creativity playing a huge role for children on the road to recovery. She left the hospital to find her purpose through design, and during a summer in London, the idea of Grounded Kidswear was developed. This family-owned company designs unisex, functional kids clothing with a foundation in art & giving back. Every month, they pledge a portion of their net sales to charities focused on the well-being of kids around the world. Changing the Lives of Children ... One Song at a Time - Ten-year-old Jaden Levinson headlined a concert to benefit CCRF on Sunday, May 6, 2012 at Oak Canyon Community Park in Oak Park, California. We'd like to thank the very talented Jaden for her wonderful contribution to support pediatric cancer patients, as well as all of you in attendance for making the event such a success! 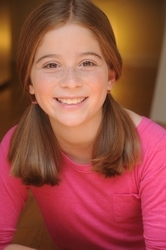 We are also excited to announce that Jaden will perform the National Anthem at next year's Kids 4 Kids Run/Walk 2013! WIN RYAN SHECKLER'S RANGE ROVER - April 2008, Ryan Sheckler, Professional Skateboader and Star of MTV's "Life of Ryan" auctioned off his customized Range Rover. Ryan's fans raised $202,777.65 for CCRF and the highest bidder, Drake Kemper, got to drive off in Ryan's car! Drake Kemper in his new Range Rover! USAA REALTY'S BOOK FAIR - Thank you to Ashley McGovern and our friends at USAA Realty for donating a portion of the proceeds from their "Books Are Fun" Book Fair to Children's Cancer Research Fund. BELLA STRADA - KidsArt studio in Los Altos, California hosted Bella Strada, a street chalk painting festival and silent art auction in June 2007. Artwork created by their students was auctioned off at this Event and the proceeds benefited Children's Cancer Research Fund. THE BEST TRUFFLE YOU'LL EVER TASTE - Purchase truffles from Eleanor Joseph Confections and they will donate a percentage of sales to Children's Cancer Research Fund ("Confections Extraordinaire Because We Care")! For over 30 years, Eleanor Joseph has made outstanding gourmet truffles. Each truffle is individually hand rolled with care and affection by skilled artisans using only the finest natural ingredients, they guarantee your fulfillment in each perfect morsel. 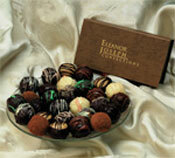 From presentation to taste, Eleanor Joseph Confections are sure to please the most discerning individuals. So, whether as a treat for yourself, or a gift for someone special, let Eleanor Joseph Confections be the perfect choice for all chocolate lovers. BRANDI CHASTAIN... SHE DID IT AGAIN! - Brandi appeared on Celebrity Poker Showdown on February 15, 2005 and won $5,000 for CCRF. In January 2004, our multi-talented, World Cup soccer player, Brandi Chastain, participated in the 3rd Annual Michael Jordan Celebrity Invitational golf tournament. She "scored" a hole in one for the kids by choosing Children's Cancer Research Fund as the charity she played for. Not only is Brandi now a golfer but, she is also GREAT on game shows! She has won money for CCRF on Jeopardy!, Weakest Link and Who Wants to be a Millionaire!! EUCHRE NIGHT - For 3 years, in Clarkston, Michigan, people have gathered on one special night to play euchre and raise money for Children's Cancer Research Fund. Organized by Russ and Denise Tarnowsky, Euchre Night is to honor the memory of Russ's brother, Scott Tarnowsky, who lost his battle against cancer in February 2000 at the age of 29. Everyone gathers in November to play their favorite game, Euchre, have lots of laughs, raise money for Children's Cancer Research Fund, and remember a very special man, Scott. 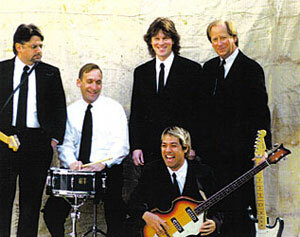 TICKET TO RIDE - Michael Manister and his band "Ticket To Ride" came up with a creative way to raise money for Children's Cancer Research Fund. At a October 2003 show in Hicksville, New York, his band played classic rock songs and during breaks sold our "We Care Holiday Bear". 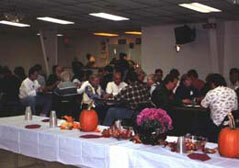 Not only did the crowd have s fun evening but, the night benefited a worthwhile cause. DODGER ERIC KARROS MAKES HOME RUNS COUNT - Because of his friendship with a young child who passed away from cancer, Dodger First Baseman Eric Karros made a pledge to donate money for every home run he hit in memory of this child. After 23 home runs, Eric chose CCRF to be the recipient of his caring (1993). 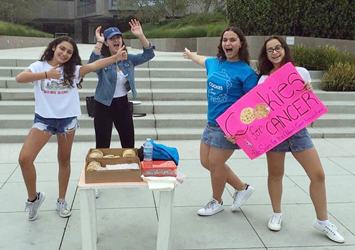 CHILDREN'S CANCER RESEARCH INSTITUTE - In 1999, CCRI of San Francisco, founded by Dr. Jordan R. Wilbur, chose Children's Cancer Research Fund to continue their work and transferred their assets to CCRF. KIRK CELEBRITY SPORTING CLAY INVITATIONAL - Hosted by retired San Francisco 49er, Randy Kirk, this event was well attended by the sports community (May, 2000). KIDS 4 KIDS - CCRF has been the recipient of children helping other children through various projects. Thank You to these children and all the kids throughout the country who, in their own special way, have helped make a difference for children with cancer! 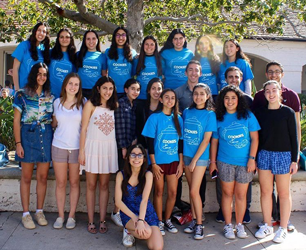 Harvard-Westlake - School's 7th grade Community Service Outreach Program for making Spring gift baskets for children in the hospital. Stephen Loughlin - Stephen, 10 year old budding author from Illinois, helps children with cancer by donating proceeds from the sale of his "John and Sean" mysteries. Sarah Morris - decided for her 8th Birthday that she would like to do something to help children with cancer. 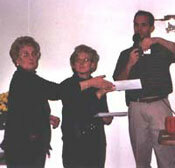 So, in lieu of gifts, she asked her friends and family to make a donation to CCRF. 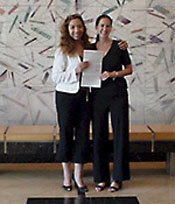 Rachel Cohn - celebrated her Bat Mitzah in 2002 by asking her guests, that instead of presents, to make a donation to CCRF. Chaynee Atwood, - an 8 year old from Texas, wanted to make a difference by donating some of her Christmas money to help children with cancer.